A few weeks ago I was doing some work at the Green Bean, a local coffee house in downtown Greensboro, when I was distracted, in a good way. The Green Bean regularly curates art shows throughout the year and on this particular day, the Self-Portrait and Identity show was still hanging. Approximately 10-12 works in a range of media hung on the long wall across from the bar. I looked up long enough to notice a mother walking slowly from the back of the room with her two-year old son in her arms. Every few steps, he would point to an art work, energetically mumble a few words to his mother, move to the next work, point, mumble a few words and so on. 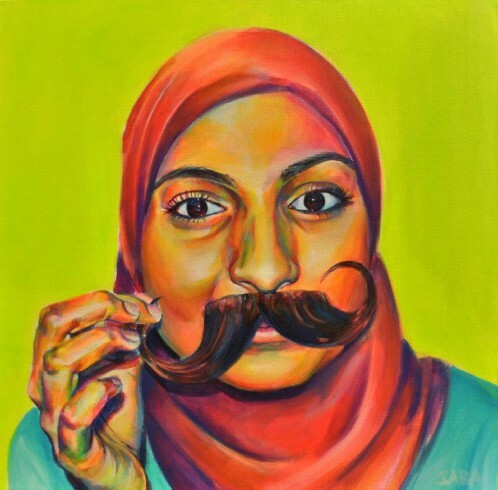 In particular he was responding to the work of Saba Bernard, a Raleigh based artist whose large vibrant paintings depict strong Muslim Women. I was so intrigued by his looking and his response and wished I could understand what he was saying. My interest prompted me to put aside my work and make a few notes about the significance and implications of what I was seeing. First, this toddler was actively looking at the works, making distinctions between the art and the rest of the visual stimuli in the room and working to make sense of what he saw. Full of bright colors, textures, patterns, and glittering details, he noticed the art as something distinctive, of interest, and unique. Was I seeing the nascent crafting of aesthetic engagement and preference? How would the interaction with the work add to his visual memory? If we work from the idea that we store images we come in contact with then, he was collecting, adding to, and processing images which will inform his future interactions with visual stimuli and his appreciation of and perhaps practice as an artmaker and world maker. Could these kinds of interactions, if sustained, make him more tolerant of diverse art forms artists, and ideas? Second, the seeing of the works and a very eager desire to share his ideas with his mother constitutes emergent literacy whereby the art gave him something to talk about. Looking at art was something to be shared. The Green Bean, by showing and valuing art, became a social space that encouraged talking about that which caught his eye and interest. His effort to translate the visual into language, in and of itself, is something to be valued. Third, these observations prompt us to ask, 'Just what do we give our children to talk about? What is the quality of the images our children absorb on a day to day basis?' Unfortunately much of what children absorb in contemporary culture comes in the form of advertising, cartoons, and consumer goods which feature homogenized, stereotyped, and highly reproduced imagery severely curtailing not only aesthetic awareness, visual literacy, and education but also a tolerance for difference. Additionally, children are often considered to be too young or too unsophisticated to make sense of artwork and therefore they are provided child-like imagery and cartoons which are assumed to be more easily understood. Yet research coupled with all of my conversations with children about what could be considered too sophisticated artwork demonstrate something very different as this scenario suggests. Finally, art in its myriad of styles and forms inspires a wide array of responses and teaches that difference, nuance, and subtlety are to be valued and chased. That imagination, play, experimentation, and mistakes are in fact the stuff of a great education and in essence-- something to talk about. Exposing children to art and artmaking processes is essential to the development of knowledgeable, creative, imaginative, and productive citizens. Let’s commit to giving children something to talk about that is inspiring, thought-provoking, and even life-changing. Bring your children to the The Gallery at Greenhill or Artquest today! And look for Saba Barnard’s work at Greenhill in the upcoming exhibition, Fritz Janschka’s Portrait Museum and Self Portraits by NC Artists, on display January 30 - April 2, 2015.